If there's one thing I love about social media is that it keeps me in touch with Paul, my family and my closest friends with just a few clicks here and there. More so that we have a good mobile data plan (hooray for Singtel!) here in the Lion City that I can say that I'm online, all the time. On days when I'm feeling a bit homesick, I'd send a simple message to my high school friends to ask how they're doing. My sister and I would update one another with our daily schedules down to even sharing what we each had for lunch and/or dinner. 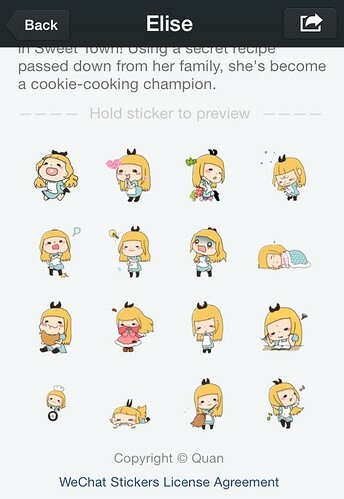 Over at WeChat, we would continue with our exchange of stickers as we really find them very cute! Speaking of stickers, I like this one called Elise. 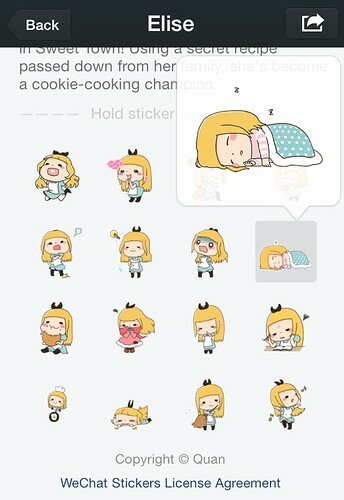 It shows a set of animated icons of a cute blond girl singing, saying I Love You, cooking, crying, eating a cookie and even sleeping! Well, here's a trivia for you all: did you know that local celebrity and newlywed Iya Villania channels the persona of Elise? This is just one of the three sticker personalities created to match a local celebrity. The other two represents Iya's husband and TV host Drew Arellano as well as Vice Ganda. Can you guess which among the stickers these are? Have fun connecting and catching up with friends and family over a WeChat. It's available for download for all mobile devices using iOs, Android, Symbian, Windows and even BlackBerry! To know more about WeChat, visit their website or like them on Facebook!